In the summer of 2004 a phenomenal article was published in The Newsletter of the Memory Disorders Project at Rutgers University. Claudia Osborn a hard-driving D.O. from Grosse Point, Michigan was struck by a car during a bike ride near her home. Dr. Osborn suffered brain damage, a condition called adynamia. The frontal lobes of her brain which perform executive functions such as decision making, abstract thinking and planning was damaged when her head hit the pavement. Since the accident Claudia has needed help from family, friends and caretakers. For brain injury patients however, it is important to have people who foster independence so that they do not stay dependent on people. Claudia has one pair of helping hands that takes the form of "helping paws". His name is Micah Matisse. 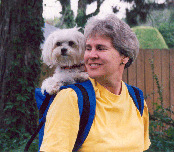 Micah is a service dog trained to help Claudia to function independently. She can carry him around in her backpack. Because of her adynamia she tends to shut down and not be as alert in specific situations. Micah "turns her back on" Micah makes sure she is alert and ready to board her flights on time. He reminds her to take her medications and unfailingly returns her to her hotel room after her daily walk. Micah is "copilot" rather than "codependent"! Micah rides shotgun in her backpack when she is roller blading and gently nudges her if someone else approaches the path. Claudia's tendency to become inattentive would sometimes result in collisons with other people. My Maltese Happy is the same way! If I become unfocused during errands or checking rituals before leaving the house he barks or grunts as if to say "hurry up!" What a helpful companion. This is a miracle that I am in awe of every day since I had never seen a Maltese before in my life! Until about 2 years ago. They have however been bred for centuries as companion dogs. Hi – Will you please post a link to your Blog at The Maltese Community? Our members will love it. It's easy to do, just cut and paste the link and it automatically links back to your website…. You can also add Photos, Videos and Pup Classifieds if you like. It’s free and easy.